The New York Times & Bay Citizen report on the gun violence that plagues East Oakland's International Boulevard, one of the only streets open to mobile vendors. 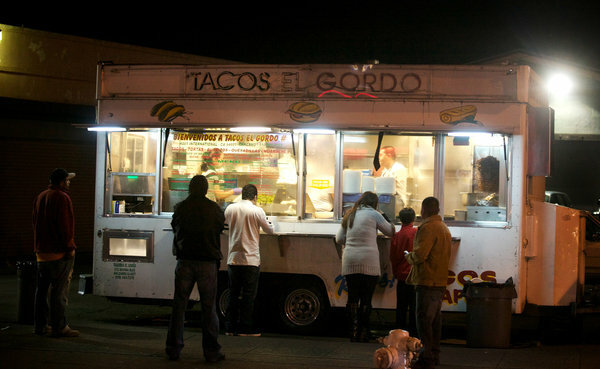 A five-year-old died on New Year's Eve, hit by a stray bullet from a barrage directed at his father's taco truck. There are only 34 licensed vendors but 126 members of the recently formed vendor's association--suggesting that the majority of vendors are part of America's informal economy. I spent most of the past four years hanging out with street hawkers, smugglers, and sub-rosa import/export firms to write Stealth of Nations, a book that chronicles the global growth of System D--the parallel economic arena that today accounts for half the jobs on the planet. Prior to that, I lived in squatter communities across four continents to write Shadow Cities, a book that attempts to humanize these vibrant, energetic, and horribly misunderstood communities. My articles on cities, politics, and economic issues have appeared in many publications, including Harper's, Scientific American, Forbes, Fortune, The Nation, The New York Times, The Washington Post, Metropolis, and City Limits. Before becoming a reporter, I worked as a community organizer and studied philosophy. I live in New York City and do most of my writing on manual typewriters.